BitTorrent Set To Rebrand Itself As Gyre? When the latest alpha version of uTorrent was released earlier this week several users spotted something unusual in the 'about' window. For years the uTorrent client belonged to BitTorrent Inc., but all of a sudden ownership was being credited to an unknown company named Gyre Inc. The uTorrent team was quick to fix this 'coding mistake,' but they couldn't wipe out a trail of evidence suggesting that BitTorrent might rebrand itself in the near future. A few days ago the latest uTorrent alpha release saw the light. Among other things, the new version aims to make downloads even faster for users with high bandwidth connections. But there was something else quite unique about the release. Those who took a peek at the ‘about’ section saw the name of a new mysterious company. BitTorrent Inc. wasn’t listed there, but Gyre Inc. So had uTorrent been quietly sold? This vagueness encouraged us to research the “Gyre” brand and to speculate about BitTorrent’s future. Let’s start with some details on Gyre Inc. first. The company was registered in January of this year and lists BitTorrent Inc. CEO Eric Klinker as the service agent. 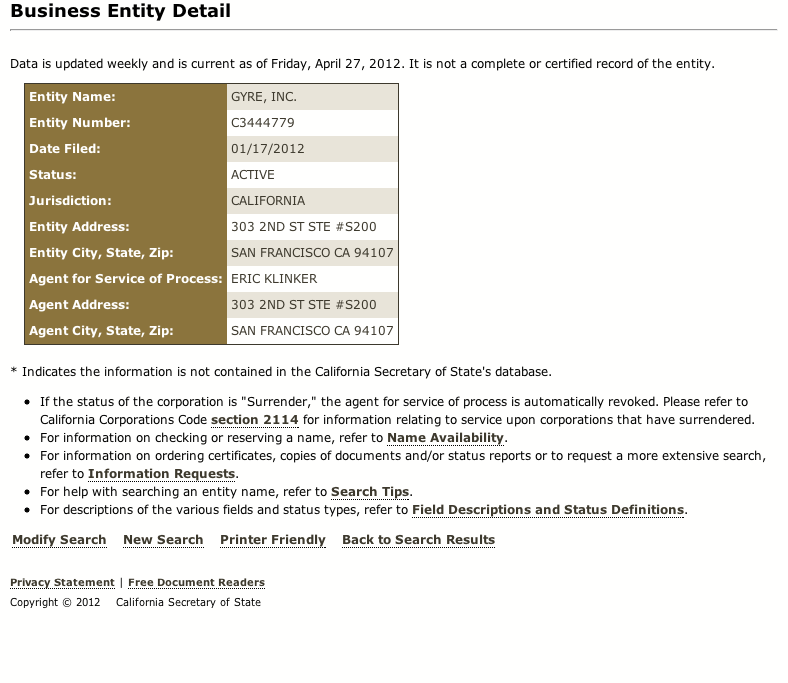 The company address is identical to that of BitTorrent’s San Francisco offices. One of the signs that points in the direction of a rebranding effort is the fact that BitTorrent Inc. copied all their BitTorrent trademarks for the term Gyre. These three Gyre trademarks cover devices, software and licensing and are identical to the existing BitTorrent trademarks. BitTorrent developers are also referencing Gyre in their code. In the new plugin.btapp.js for example we see several mentions. This is part of a yet-to-be-released product where web browsers can talk to uTorrent/BitTorrent via a plugin. 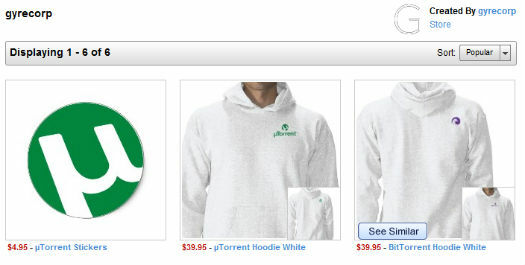 And what about the unusual fact that “Gyrecorp” is selling uTorrent stickers and shirts? But perhaps the strongest support for a possible rebranding is that BitTorrent didn’t deny this when we specifically asked about it. We were informed that uTorrent and BitTorrent will continue to be released under BitTorrent Inc. But it wasn’t specified for how long. BitTorrent Inc. wouldn’t be the first of its kind to change names. Several years ago Azureus changed its name to Vuze. This rebranding also covered the name of the BitTorrent client, but there is no indication that the uTorrent brand will disappear. The ultimate question is of course why BitTorrent Inc. needs a new brand name to begin with. Could it be the pirate stigma? Are investors pushing for something new? Is there a sale on the horizon? All speculation for now, but something is up for sure.